Scott Morrison, the ‘Prosperity Gospel’, and neoliberalism. Kunjungan Perdana Menteri Australia Scott Morrison ke Indonesia.Australian Embassy Jakarta. flickr cc. Sounding surprisingly like an evangelical revivalist, Prime Minister Morrison in Albury on 6 September highlighted the need for love in our country, for every Australian, and that this set the value base for his own thinking and presumably for policies of his government. No one in Albury objected to the ideal of love of neighbour, but it sounded a bit odd when people were expecting a significant statement about changed policies of his government after the leadership bloodletting. Some commentators are wondering how Morrison’s faith as a Pentecostal Christian will influence his policy decisions. Some versions of Pentecostalism have fallen into a form of ‘prosperity gospel’, that by prayer and moral self-discipline God will reward you with health, happiness and material abundance, and assure you of heaven in the next life. This type of ‘prosperity gospel’ has spread from the United States particularly to poorer parts of the world, Africa, Asia and Latin America. The implications of such a stance in the view of Bishop George Browning are that health and riches are ‘a sign of God’s blessing, and poverty a sign of divine disapproval – even punishment’; the poor only have themselves to blame for their ill fortune, and need to be pressured out of laziness and to exercise personal responsibility. The ‘prosperity gospel’ reduces religion to a magical technique to advance one’s individual self-interest, ignoring that the Gospel is meant to be ‘good news for the poor’, the Bible’s code for all in distress. The prosperity gospel instead focuses on individual wellbeing, rather than promoting wider concepts of solidarity and social justice in an effort to promote the common good of everyone, but especially of the most disadvantaged or marginalised. Open cut coal mine Hunter Valley. 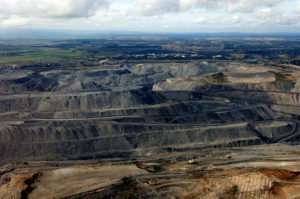 Beyond Coal & Gas Image Library. flickr cc. Such ‘prosperity gospel’ thinking becomes a perfect fit ‘as a theological justification for economic neo-liberalism’, and ‘serves the economic-political-philosophical concepts of a neo-liberal model’, Antonio Spadaro SJ wrote on 18 July in the Vatican paper, La Civilita Cattolica. Neoliberalism is not the offspring of the ‘prosperity gospel’ of course. Notable Catholic and other Christian members in the political parties have been keen proponents of neoliberalism in economics and philosophy, despite mainstream Christian social teaching, especially of Pope Francis and his predecessors. Pope Francis has strongly criticised the unfairness and inequality resulting from neoliberalism, especially in his 2015 encyclical Laudato Si’. This most authoritative form of Catholic teaching also urgently warned of the ‘catastrophic’ consequences of climate change. Morrison is no doubt sincere in his beliefs as a committed member of the Pentecostal Horizon Church, formerly part of the Assemblies of God. In his maiden speech in Parliament in 2008, he invoked Jeremiah 9: 24 that the Lord delights in ‘loving-kindness, justice and righteousness on earth’. Morrison identified his values as ‘to fight for a fair go for everyone to fulfil their human potential… [without] diminishing their personal responsibility for their own wellbeing’. He wished to defend ‘the sanctity of human life and the moral integrity of marriage and the family’. He quoted Desmond Tutu about standing by ’the poor, and the hungry, the homeless and the naked’. He thanked Brian Houston as a ‘mentor’ and Leigh Cameron of the Hillsong Church for their great help to him. Mainstream Christians would applaud these sentiments, but challenge his actions as Minister for Immigration over his harsh treatment of refugees and asylum seekers. How does this square with the biblical demand to care for the stranger, for widows and orphans, and for people fleeing persecution or war? As Bishop Browning wrote, as Minister for Social Services in 2015 Morrison was severe on welfare recipients and is still resisting calls to increase the abysmal Newstart allowance for the unemployed. Meanwhile the government was handing out generous tax benefits to the better-off, including through negative gearing and deductability for capital gains, as well as even to the coal industry through its fuel tax exemptions. Morrison as Treasurer pursued hard-line neoliberal policies, condemning welfare recipients as the ‘taxed nots’ while committing $65bn in tax cuts for the big corporates. More recently he rejected ‘the politics of envy’, code to disparage calls arguments for a fairer distribution of wealth, and deplored those who are ‘takers’ but not ‘makers’. How do we explain these glaring inconsistencies? Morrison’s Pentecostal beliefs are undoubtedly interpreted through the pragmatic political needs of the moment. In 2011 he said that the Bible is ‘not a policy handbook’. Indeed it is not, but Christ in Matthew 25 insists that God identifies intensely and personally with the sick, hungry, thirty, naked or prisoners, which presumably would include those in Australian detention centres. The parable depicts God as fiercely angry against those who mistreat or ignore the needs of the ‘poor’. In his defence, Morrison could say he was merely following party policy. I doubt Jesus would be impressed with such a reply. Finally, what a tangled skein is the Coalition’s climate policy. Most Australians are greatly concerned about the threat from climate change and global warming, with an unprecedented early start to the fire season down Australia’s east coast, while Morrison continues as a leading advocate for the coal sector. The Coalition parties have cast Malcolm Turnbull overboard, along with his attempts to put in place policies to reduce greenhouse emissions within an appropriate energy framework. Despite the urgent climate debate at the recent Pacific Forum, the Coalition is giving priority to reducing energy prices with little attention to aggressively reducing emissions. The omens for Australia are far from propitious.